Dan Murphy reflects on what's changed in Milwaukee's beer world in the the four years and 200 blogs since Brew City began. Plus: paying a visit to District 14 in Bay View, and more. By my count, this is Brew City No. 200. I don’t feel much pressure to make this an especially insightful post (why start now? ), but I wanted to comment on how far the brewing scene has come since late 2011. When I started, beer events were hard to come by (I listed just two in the first blog) and beer dinners were fairly rare. Now, I don’t have the space to list every event. In 2011, growlers were an unknown and Alaska Brewing had just showed up in Milwaukee. Alaskan Smoked Porter was my first beer of the week (unfortunately I didn’t keep a list of the 199 rest). One of the first bars I mentioned was The Bomb Shelter and its affable owner Greg Landig. Sadly, Landig passed away just a few months later. Breweries like Biloba and District 14 didn’t exist, but standbys like Burnhearts and Romans’ Pub did. Dozens of breweries have started distribution in Wisconsin since 2011 (Ballast Point is one great example) and there’s an astoundingly large and growing amount of variety to choose from in Milwaukee. That’s a good thing for beer lovers everywhere. I finally made a trip to District 14 Brewery and Pub (2273 S. Howell Ave.) this weekend. I should have visited sooner. I sampled a few small pours and was impressed by what I tasted. 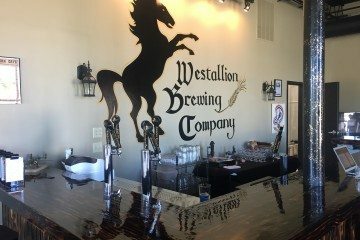 Brewer/owner Matt McCulloch seems to have a knack for stouts and porters. The Chocomatic Lovemachine was a tasty chocolate stout, and Crooked Quaker was a solid oatmeal stout. I appreciate brewers who are willing to experiment—and not all experimentation works. I was skeptical when I tried Kung Fu Too, a blonde ale made with pineapple, ginger, curry and Thai dragon peppers. But the odd combination paid off with an inviting fruit flavor followed by a slight burn from the pepper. Many more hits than misses is a good sign for any brewery, and it certainly bodes well for District 14. New Glarus Bramble Berry Bourbon Barrel is the third R & D release of 2015 and it’s outstanding. The wild brown ale from the New Glarus Wild Fruit Cave balances fruit flavor with the right amount of tartness and a hint of oak. It’s the first R & D series beer that I’ve tried, and I was impressed. Getting some of the tasty limited brew requires travel. A limited amount will be sold Thursday, Friday and Saturday at 10 a.m. at the New Glarus Hilltop Facility (2400 State Highway 69, New Glarus). Draft Magazine posted an interesting article about Nielsen Research into the habits of beer drinkers. Need help pairing beer and cheese? Check out this article that includes some local flavor. Tuesday, Aug. 4: Founders is the brewery of the month at The Malt Shoppe (813 N. Mayfair Rd. ), and that’s a very good thing. Founders brews will be on tap, and a Founders rep will be there at 5 p.m. to provide some insight into one of the best breweries in the U.S.
Wednesday, Aug. 5: Tribaratron starts at The Vanguard (2659 S. Kinnickinnic Ave.) at 3 p.m. It’s not for the timid. The event combines Metropolitan brews like Heliostat Zwickel Lager and Jeppson’s Malort, a bitter liquor that isn’t easy to drink (I’ve tried it and it’s brutal). Tribaratron heads to Honeypie Café (2643 S. Kinnickinnic Ave.) and Burnhearts (2599 S. Logan Ave.) later in the day. Wednesday, Aug. 5: Milwaukee Beer Society members are sharing their own homebrews at their weekly gathering at Best Place (901 W. Juneau Ave.) from 6 to 9 p.m. See how good these folks are at brewing. Wednesday, Aug. 5: Bierklasse at Café Hollander (7677 W. State St.) is a good one. Sample eight beers brewed by Trappist monks. Tasting and learning starts at 7 p.m. and the cost is $45. Email Bierklasse@LowlandsGroup.com for a reservation. Wednesday, Aug. 5: 3 Sheeps is taking over the taps at Ray’s Growler Gallery (8930 W. North Ave.) 5 to 8 p.m. The tentative list looks pretty good and includes standouts like Oakey Dokey IPA, flavored with toasted oak; Happy Summer IPA, a fruity brew made with Citra, Mosaic and Amarillo hops; and Seven Legged Cartwheel which adds the funk of Brett to an IPA. Thursday, Aug. 6: Don’t miss the Black Husky beer and cheese pairing at Uber Tap Room (1048 N. Old World Third St.). Black Husky owner Tim Eichinger is making the trip from northern Wisconsin and he’s bringing some of his delicious beer with him. Tickets are $20. Thursday, Aug. 6: As of this weekend there were still tickets available for the Barley’s Angels visit to The Malt Shoppe. The crew will be tasting Baltic porters starting a 6 p.m. The cost is $15 and it’s limited to 20 tickets. Thursday, Aug. 6: It’s IPA Day, so raise a glass of your favorite hoppy treat. Friday, Aug. 7: Sample a few brews from St. Francis at Discount Liquor Waukesha (919 N. Barstow Ave.) from 4 to 7 p.m.
Saturday, Aug. 8: Wisconsin beers are the samples du jour at Three Cellars (7133 S. 76th St.) from 1 to 4 p.m.